Thursday was supposed to have been an off-day. But thanks to Wednesday's rainout, the Yankees were forced to grab a win yesterday before they high-tailed it to BWI for the flight to Dallas/Fort Worth. 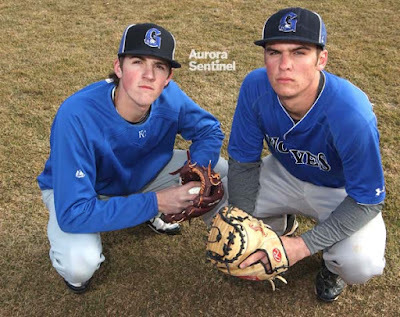 The starting pitcher for Baltimore was Kevin Gausman, Greg Bird's former Grandview High School (Centennial, Colorado) teammate. Bird was a catcher in high school so the two formed the battery for the Wolves. I was looking forward to watching Bird bat against Gausman but he was out of the lineup for Thursday's game. He pinch-hit later in the game but Gausman was in the showers by that time. The game got started on the right foot. Brett Gardner walked to lead off the first inning. There's never anything wrong with getting the speedy Gardner on base. After fellow Coloradan Chase Headley struck out against Gausman, Gardy stole second. Gausman recorded his second strikeout when Starlin Castro went down swinging. But never fear, Sir Didi's here. Gregorius hit a double to right which brought Gardner around to score. But the Yankees weren't done. Next up was Aaron Judge. Judge, showing no respect for Bird's good friend, boomed a towering shot to center. T-Ball Practice! Note to Gausman: It's probably best not to leave a high fat one over the middle of the plate. 3-0 Yankees before Sonny Gray could even pick up a baseball. With Gray cruising through the first few innings, the Yankees struck again in the top of the 3rd. Didi Gregorius, continuing his hot hitting, reached first on an infield single to short. Aaron Judge walked (his 104th of the season) so there were two men on base for Matt Holliday. Holliday's single lined to right scored Gregorius and moved Judge to third just ahead of the throw. Jacoby Ellsbury hit a one-out grounder to second which forced Holliday but Judge was able to score when Ellsbury beat the throw to first to prevent the double play. The Yankees had increased their lead to 5-0. Gausman didn't return for the start of the 4th inning which dashed my hopes for a potential Greg Bird pinch-hitting opportunity against his friend. Mike Wright took over for the O's. With one out, Brett Gardner doubled to left. Chase Headley added two more runs with his long home run to right. Star-light, Star-bright. The top of the 6th, with O's reliever Donnie Hart pitching, opened with a lead-off single by Brett Gardner. Sadly, to my disappointment, his stay on the base paths was ended when Chase Headley grounded into a double play at second. Starlin Castro came up and asked 'is this what Manny Machado did the other night?' by way of his blast to left-center. 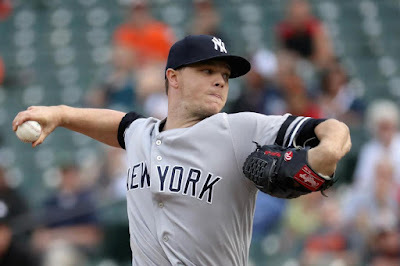 Yankees led, 8-0, and Sonny Gray was still pitching like I wish he had pitched against the Boston Red Sox. Unfortunately, Sonny ran out of gas in the bottom of the 6th. Jonathan Schoop got it started for the O's with an infield single. Adam Jones hit a grounder to short with the fielder's choice eliminating Schoop at second. Gray struck out Trey Mancini, but Chris Davis followed with a single to right center. Jones moved to second. Mark Trumbo hit a grounder to short but a throwing error by Didi Gregorius (off-balance throw over the head of Starlin Castro at second) allowed Davis to reach third while Jones scored. Great overall job by Sonny Gray but it was time for his day to come to an end. Enter Chad Green; end of inning (by strikeout). The Yankees homered again in the top of the 7th when Todd Frazier joined the party with a solo blast to left. Orioles left-fielder Trey Mancini tried to leap but the home run ball was over his glove. Chad Green powered through the O's lineup in the bottom of the 7th, erasing the only base runner on a double play. Coming into the season, I didn't really want the guy on the MLB roster and he's arguably been the most valuable (and most consistent) reliever in the bullpen. I am glad the Yankees never hired me to be a talent evaluator. Tommy Kahnle helped three Orioles find their way to the bench in the 8th. Recent Triple A call-up Ben Heller took over in the 9th and he continued the trend set by his bullpen predecessors. 1-2-3, game over. Yankees win! The Yankees (75-64) are 3 1/2 games behind the Boston Red Sox. The Red Sox were idle on Thursday but they had won the day before. The Orioles slipped back to 4 1/2 games behind the Yanks. The Yankees' lead in the Wild Card Standings is 2 1/2 games over the Minnesota Twins (the Twins beat the Kansas City Royals, 4-2). Nice job by Sonny Gray (9-9). He pitched 5 2/3 innings (102 pitches) and allowed six hits, two walks, and one run (none earned). He struck out five while lowering his season ERA to 3.22. Hand clap for the bullpen. Green, Kahnle and Heller combined for 3 1/3 innnings of one-hit scoreless relief with three K's. No drama...exactly the way I like it. As for the hitting stars, pass the hat...everyone contributed. This was a great team victory. Congrats to Austin Romine for successfully holding down the catching position while Gary Sanchez was on the golf course..or at the bar or wherever he may have been for three games off. 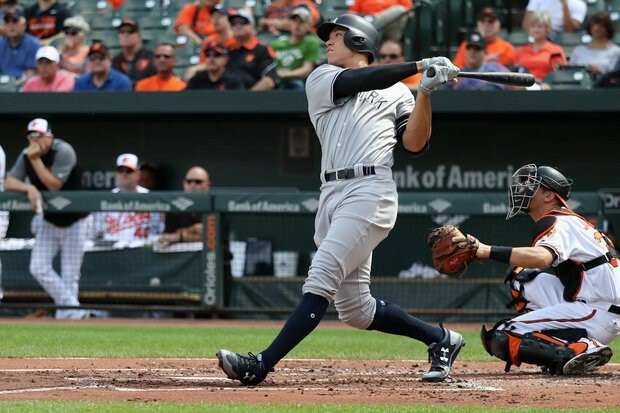 The Yankees came close to the series sweep but taking two out of three at Camden Yards is still a notable accomplishment. It's a good springboard for the next series. The Yankees travel to Dallas/Fort Worth to take on the Yu Darvish-less Texas Rangers. The Rangers remain in the hunt for a Wild Card spot so they'll be ready to play. Like the Baltimore Orioles, the Rangers have a team of sluggers with 218 home runs this season which leads MLB. Any mistake pitches will be making long distance travel plans. The Rangers' Ballpark has long been one of my favorites. Hopefully it holds good things for the Yankees this time around. The Yankees Universe was deeply saddened yesterday when it was learned that Yankees Senior Adviser Gene "Stick" Michael had passed away due to a heart attack at age 79. There will be many obituaries and that's really not the intent of my mention of his passing. Growing up with the Yankees as my favorite team, Stick was such an integral part through the years. I don't really remember his playing days, but I do remember his brief managerial stints with the team in the early 80's. Of course, he directed the course of the franchise in the early 90's as the team's general manager while George Steinbrenner was serving his suspension and was probably the man most responsible for the late 90's dynasty. 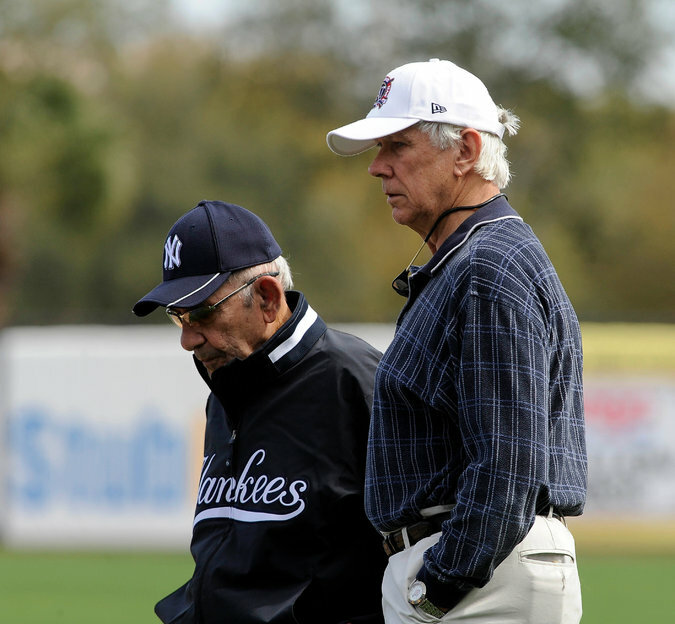 What really stuck out to me about Stick over the years was his strong sense of loyalty to the Yankees organization and his ability to speak his mind and hold his ground with the Boss. It was tough when Stick left the Yankees to become the manager for the Chicago Cubs in 1986 but I was happy when he found his way back home. 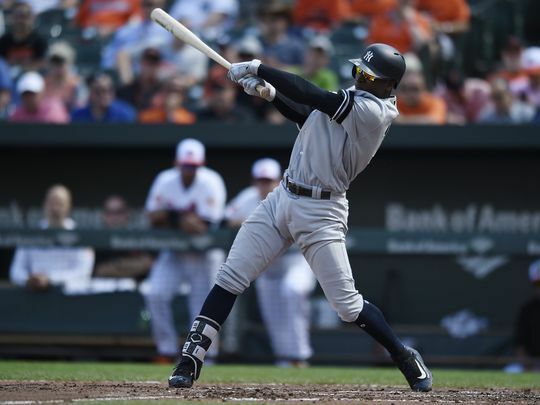 The Yankees will wear black armbands on their left sleeve for the duration of the season in honor of Stick. A few weeks ago, everybody was talking about how the 2017 Los Angeles Dodgers were among the greatest teams of all-time. Now, after losing seven in a row and 12 of 13 games, they'd have to go undefeated the rest of the way to match the 1998 Yankees. Clayton Kershaw was pounded last night by the Colorado Rockies in his own ballpark. If the Dodgers can't figure this out, their stay in October is going to be very short-lived. The Triple A Scranton/Wilkes-Barre RailRiders lost the first game of their first round five-game series against the Lehigh Valley IronPigs, 6-5, in 12 innings. Game 2 is set for tonight at Coca-Cola Park in Allentown, PA with Chance Adams on the mound for the RailRiders. Have a great Friday! Let's keep contributing the 'W' column! Go Yankees!